Two hours later, I had explored many of the main avenues and expressways of Monterrey as well as the toll road from Monterrey to Nuevo Laredo. Having visited Nuevo Laredo several times before the drug wars rendered that inadvisable, I had always wondered what the main shopping street looked like further down than the half-dozen or so blocks I had usually plied. No problem, it’s on Street View. Uh oh, now I’m on the old two-lane federal highway going back to Monterrey. Gotta check that out. It didn’t help that I had the iTunes cranked-up. I could have kept going all the way to Mexico City if not for a gnawing hunger in my belly and a full bladder. Similar recent “trips” have taken me to Berlin, Frankfurt, Paris, much of southeastern England, and Tokyo, not to mention a plethora of US cities. 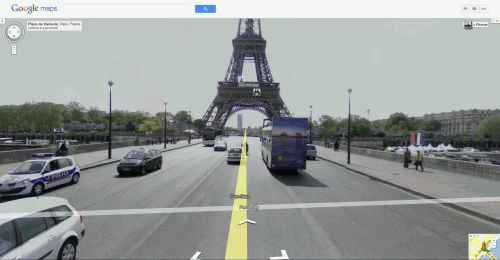 My name is Brian and I’m a Street View addict. Don’t judge me– it’s gotta be in the genes. My three-year old is already showing the signs of having the malady: he loves being in the car, he knows when we missed the turn to go home or to grandma’s, and he can point the direction to my office from nearby streets that he’s never been on. I don’t dare introduce him to Street View. Bye-bye Elmo. Well, gotta go. Another world city is waiting to be explored during my lunch hour.